The National Electronic Code requires that disconnect switches be in the line of sight of a user, motor and the equipment the motor drives. This allows the motor to be shut down for maximum safety. Now, Hubbell Wiring Device-Kellems has upgraded its 30amp disconnect switches to include LED lights that takes this line-of-sight visibility to the next level. The company has introduced technology, dubbed inSIGHT™, that incorporates six LED phase-indicator lights. Three LEDS show the status of the line side and three lights represent the load side wiring. 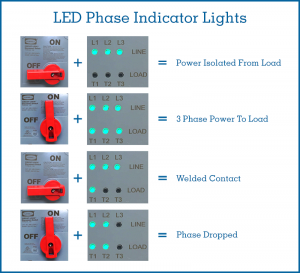 The electrical status of each phase is within sight and clearly displayed on the cover so that users are provided a secondary way to confirm make/break on all phases prior to removing the enclosure cover. For example, if there is a welded contact or dropped phase the operator can determine that a problem exists (see Fig. 1). With an ever growing focus on safety improvements, Hubbell disconnects provide a difference you literally can see. 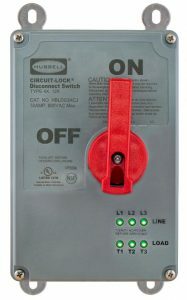 Hubbell phase-indicating disconnect switches are available in non-metallic, and stainless steel square top and sloped top versions. Replacement covers are available for upgrades to existing installations. Fig. 1: LED lights provide users with the status during different phases of line and load wiring. 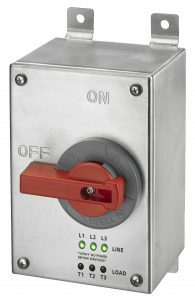 The 30A Circuit-Lock Disconnect Switches are available with or without a jog switch to slowly move the motor forward or in reverse. Customers have the option to either purchase the entire disconnect unit or an LED replacement cover for compatible existing 30A Disconnect Switches. 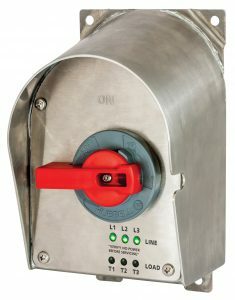 As with most NEC-certified disconnect switches, when locked in the “off” position, the high-visibility red rotary handle complies with OSHA lockout/tagout requirements. When in the “on” position, the cover cannot be opened. Designed to be tough, reliable and provide exceptional performance in the most grueling conditions, the disconnect switch’s IP69k rating means that it can withstand high-pressure, high-temperature washdowns. The units have been tested to withstand extremely hot water (176degF) and high-pressure water spray (1450psi) from various angles. In other destructive testing, the device is placed in a dust chamber for 8 hours while a vacuum attempts to pull dust into the sealed housing. The switch is also certified by the NSF for use in food processing applications, and is UL Listed for Type 4X, which means that it can be used for either indoor or outdoor applications. It is also listed for Type 12 enclosures, which are enclosures constructed without knockouts for indoor use to protect personnel against access to hazardous parts, and to provide ingress protection for the electrical contents. May 2 – May 6, 2016 is National Fall Prevention Stand-Down week. Employers who participate in National Fall Prevention Stand-Down Week can receive a Certificate of Participation signed by the Secretary of Labor, Thomas E. Perez. The downloadable certificate will be made available beginning May 2, 2016 on the OSHA National Fall Prevention Stand-Down certificate page. Commercial construction companies of any size, residential construction contractors, subcontractors, independent contractors, highway construction companies, general industry employers, the U.S. Military, other government participants, unions, employer’s trade associations, institutes, worker interest organizations, and safety equipment manufacturers. The first step in fall prevention safety is to talk about it – when there is a clear understanding of proper protocols and procedures that provide the most safety, there is a decrease in accidents. Following the initial discussion, the next preventative measure is to make sure employees have proper safety equipment for fall prevention. PPE, or personal protective equipment, better equipped for fall hazards include fall protection lanyards and pulling grips. 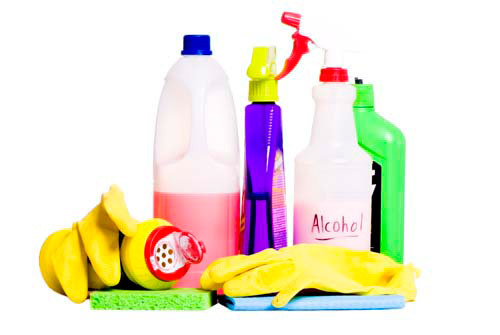 Finally, in addition to providing the necessary safety supplies make sure employees are properly trained on how to use all equipment. Improper use of safety equipment can also lead to accidents that could have been avoided with sufficient training. For more information on OSHA’s fall prevention safety campaign, be sure to visit https://www.osha.gov/StopFallsStandDown/ and learn more. 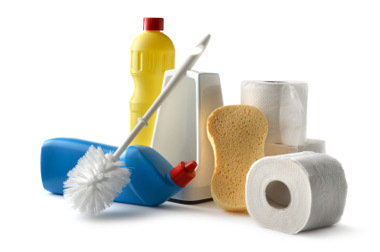 Use National Fall Prevention Stand-Down Week as an opportunity to review safety, reinforce safety protocols and preventative measures, and maintain appropriate inventory levels of safety products. Employers who participate in National Fall Prevention Stand-Down Week can give feedback directly to OHSA about their Stand-Down program by sending an email.